You may have already noticed, but one of these birds is not like the rest. The bird front and somewhat centered towards the left is a whooping crane (Grus americana)—North America’s tallest bird. This species is listed as federally endangered, but managed as “threatened” under the endangered species act. Apparently, the reason being is that they were able to augment wild populations with non-migratory birds that were either hand-reared in captivity or translocated as fledglings. Nonetheless, multiple different breeding projects have been organized or are currently underway. The bird you see in this image is known as “1644.” This bird is an 11 year old female that originated from the “Florida Experimental Nonessential Population.” Since 1993, when this program was initiated, 289 captive-raised individuals were released; today, only 14 of these birds remain. It may be difficult to discern, but this bird—like many other whooping cranes—is tagged. The purpose of this is to monitor the population trends over time. This can be done by simply viewing the assorted color bands located on the birds leg using binoculars or a spotting scope. There is also typically a band that is etched with a unique number, giving it its name. This picture was taken at the observation deck at La Chua Trail, Paynes Prairie where it resided with thousands of migratory sandhill cranes. Patiently waiting for a man to sweep her off her feet she stuck around for about a month or so—from my own personal observation. 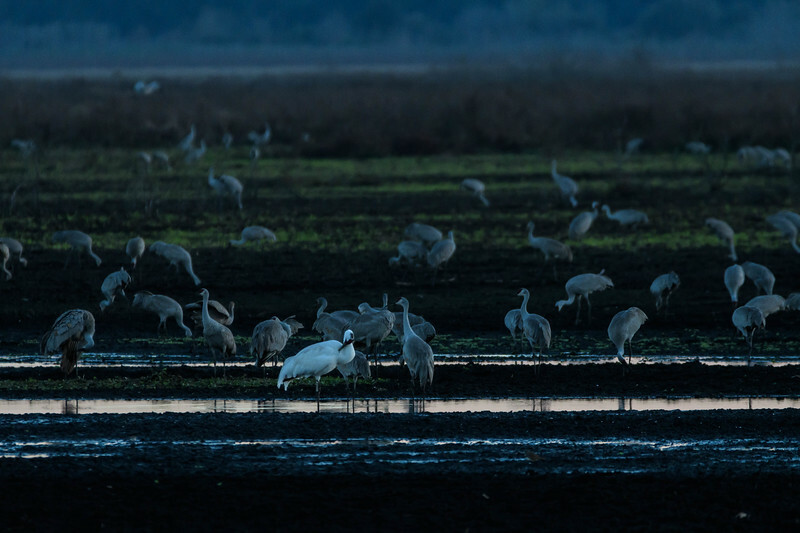 Soon after all the sandhill cranes began their migration back north this whooping crane found her way to Sweetwater Wetlands Park. Here you are able to get much closer views where otherwise at La Chua, you would usually spot it at least 100 yards out in the prairie. To this date (3/30/2017), you can still find 1644 at Sweetwater, but I suggest you go early as it regularly flies away as the day progresses.